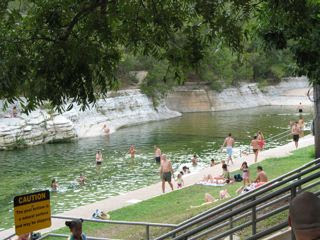 a Master Plan for Barton Springs Pool. to enter the pool area. to suction pumps aquarium style, only larger. Bolts, expensive ones, maybe $10@. I want the city to spend money there. The work was given to existing staff. retrofit, no items to re-vegetate the pool. without a public vote to make this happen. Is this a 6.2 million dollar screw driver? and natural path on south side of pool. 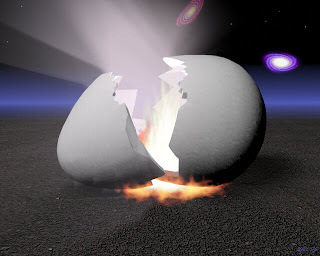 Just a few minutes ago, a good friend and reader called me and remarked about the post where we talked about this time as not only the end of the world but also truly the beginning. He reminded me that according to Hopi prophecy, we are now at the cusp of the fourth and fifth worlds. There are many prophecies in the native american culture, but the Hopi prophecies have been quite prescient. They were to go when the motherland of the Hopi and other Indian brothers were about to be taken away from them and their way of life was in danger of being completely destroyed by evil ones among the White Men and by some other Indian brothers who were influenced by the White Race. The Emergence to the future Fifth World has begun. It is being made by the humble people of little nations, tribes, and racial minorities. "You can read this in the earth itself. Plant forms from previous worlds are beginning to spring up as seeds. This could start a new study of botany if people were wise enough to read them. The same kinds of seeds are being planted in the sky as stars. The same kinds of seeds are being planted in our hearts. All these are the same, depending how you look at them. That is what makes the Emergence to the next, Fifth World. The following extraordinary Hopi prophecy was first published in a mimeographed manuscript that circulated among several Methodist and Presbyterian churches in 1959. Some of the prophecies were published in 1963 by Frank Waters in The Book of the Hopi. The account begins by describing how, while driving along a desert highway one hot day in the summer of 1958, a minister named David Young stopped to offer a ride to an Indian elder, who accepted with a nod. "I am White Feather, a Hopi of the ancient Bear Clan. In my long life I have traveled through this land, seeking out my brothers, and learning from them many things full of wisdom. I have followed the sacred paths of my people, who inhabit the forests and many lakes in the east, the land of ice and long nights in the north, and the places of holy altars of stone built many years ago by my brothers' fathers in the south. There have been many ages and epochs. Call them worlds if you like. The Hopi saw their world end when the white man came. The Fourth World is ending. And the Fifth World comes. Thanks to the Energy Bulletin, here is a bit of a piece from Guy McPherson's Nature Bats Last blog. I've edited it a lot because the piece is actually a pretty long speech. It's worth a full read though. Oil supply -- at the level of the field, county, state, country, or world -- follows a bell-shaped curve; the top of the curve is called "Peak Oil," or "Hubbert's Peak." We passed Hubbert's Peak for world oil supply and began easing down the other side about two years ago. We'll fall off the oil-supply cliff next year. Because this country mainlines cheap oil, it is easy to envision the complete collapse of the U.S. economy within a decade. The Great Depression will seem like the good old days when unemployment approaches 100% and inflation is running at 1000% per year. Obviously, this is a very good thing … for the world's cultures and species, other than our own. After all, in the name of economic growth we have ripped minerals from the Earth, often bringing down mountains in the process; we have harvested nearly all the old-growth timber on the continent, replacing thousand-year-old giants with neatly ordered plantations of tiny trees. We have hunted species to the point of extinction; we have driven livestock across every almost acre of the continent, baring hillsides and engendering massive erosion. 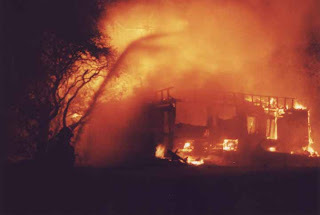 We have plowed large landscapes, transforming fertile soil into sterile, lifeless dirt; we have burned ecosystems and, perhaps more importantly, we have extinguished naturally occurring fires. We have spewed pollution and dumped garbage, thereby dirtying our air, fouling our water, and contributing greatly to the warming of the planet. We have paved thousands of acres to facilitate our movement and, in the process, have disrupted the movements of thousands of species. As I wrote in one of my recent books, the problem is not that the road to Hell is paved with good intentions -- it's that the road to Hell is paved. And when I say we keep making these choices, I do not mean you and me -- we have essentially nothing to do with it -- I mean the politicians and CEOs who run this country. They are killing the planet and, when they notice the screams, they turn up the volume on Fox News. When I tell people about Peak Oil, the immediate response is something like, "C'mon, the Dow Jones Industrial Average is setting records; the economy looks great." ..what about runaway greenhouse? Runaway greenhouse simply means that positive feedbacks are overwhelming Earth's climate system and we cannot stop the warming of planet Earth. Had we passed the oil peak a decade earlier, we would have been forced to reduce CO2 emissions and therefore prevent the frying of the planet. Can we get from here to there? We have the best excuse in the world to not act. The momentum of civilization is powerful. Resisting those in power will almost certainly lead to imprisonment, torture, perhaps even death. Those are pretty good excuses to forego action. So the question becomes, in the words of author and activist Derrick Jensen: "Would you rather have the best excuse in the world, or would you rather have a world?" It reminds me of the Jack Benny skit, when the robber comes up to him and says "Your money or your life!" Several weeks ago, I came upon this walkability site. I tried my neighborhood and it did pretty good with an 80. "Typically, when people think about how sustainable a neighborhood is, they probably think of neighborhoods with lots of organic stores, solar paneled roofs, small hybrid cars and a strong recycling/composting culture. And all of those ideas have their place, but I would argue that the most important is how walkable/bikable a neighborhood is. From Streetsblog, we discover a new website, Walkscore gives us a chance to calculate this aspect of different neighborhoods. While this is admittedly a crude measure and has some fairly obvious flaws, it is in many ways a good rough measure of how walkable a given location is compared to others. Just pure density does not a walkable neighborhood make. It requires a healthy mix of residential, retail, services and office space. It means basically being able to accomplish pretty much any of your necessary daily trips by foot and not requiring an automobile. One key lesson from walkscore after taking a tour of various places that I have lived before is that while DENSITY is pretty important, ZONING is probably even more important. My childhood home in Staten Island, which was in residential only zoned area, received a score of 50, while similarly dense places I have lived in Ithaca received over 80. Also, ultra-dense places like Manhattan have fairly similar scores to mixed use areas of the outerboroughs and even small town centers. A low-cost, pro-small business initiative that would vastly improve the walkability of any neighborhood, would be to ban residential-only zoning and specifically encourage mixed use zoning everywhere, even in the heart of the most suburban sub-divisions. 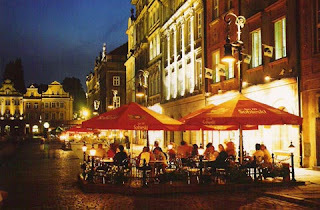 Even if all plots at street intersections became eligible for commercial, retail or other uses, it would go a long way to producing more walkable communities. Another lesson that I hope people have started to realize is that transportation is not just Vehicle Miles Traveled (VMT) and trying to figure out how to replace all of them with non-petroleum sources of energy. People in walkable communities make just as many, if not more, trips in a given week and they travel much shorter distances. Transportation policy should be about providing people with access to the goods, services, workplaces that they need, not encouraging land use patterns that place all of these as far from each other as possible and desperately trying to link them all together with roads and highways that are costly to build and maintain." I have spoken often about remaking our western car cities into a quilt of villages. And the suggestions here, although unsophisticated, are pretty realizable. By creating walkable and bikable environments, we can not only reduce our carbon footprint, we can reduce our waistlines, as well as our doctor bills. And I still want to see the overall inner city connected with covered elevated walking, biking, and very light vehicle (VLV) path that allows you to blast from end of town to the other in a fraction of an hour, all the while viewing the hills and the creeks below. Since these skyways can be engineered to pedestrian standards, they would cost a fraction of our current automotive flyways, and they would be a unique urban amenity. But good walk scores are not so good for big business. And that ain't so bad. The News today will be full of Gonzo, having gone gonzo, going. he was also the coauthor of the Patriot Act. And there has been gambling in Las Vegas. I watched the new Sacco and Vanzetti documentary last night. Our Justice department was just as good then. Or our ancestors from across the sea. As a cover for our inhumanity to ourselves and others. Yet has never managed to practice it. Yet crushes it in the Wall of the Street. To pass tests, not to think past the test. Than all the other countries combined. Any better than it sees itself. We roll through our days as if we are a pin ball. We eat our food like any other domesticated animal. We love our friends and hate our enemies. Even as we wear our Chinese clothes and our Chinese shoes. If this isn’t the end of the World? Just why in the heck isn’t it? It is actually just the beginning. Charles Freeman was not just an electrical power engineer. He was a strong proponent and advocate of clean electrical power. For much of the last 2 decades, he served on the board of directors of the Texas Renewable Energy Industries Association, where he served as its president for four terms. He was TREIA’s current president until his resignation just six weeks ago. Charles was instrumental in the forming and fashioning of laws and regulations that would ultimately make Texas the leading state for wind power in the nation. Professionally, his firm, Electrical Power Engineers, is one of just a few premier companies that work with Wind Developers and Utility companies to site and plan new projects. Charles was also a big supporter of solar energy, investing in a new solar technology that may someday be the state of the art for clean, affordable solar energy. He had an all-electric pick up truck which could pull a trailer equipped with a battery charging generator, thus making his Ford one of the first plug in hybrid vehicles in the State. Charles brought skill, professionalism, and resources to a fledgling industry that needed what he had to offer. He will be missed greatly, but his contributions to a cleaner, better, more secure Texas will live long after our short walks on this earth. Funeral services were held at St. Paul’s Episcopal Church, 515 Columbus Ave., Waco, at 1:00 p.m. on Saturday, August 25. It was not my pleasure to know Charles Freeman as well as others did. But it was not necessary to know him well to appreciate Charles Freeman fully. My memory of Charles is as an eminently practical man. An engineer by discipline, he mastered the conditions of physicality. And I remember him as a man of vision. He saw for Texas and our nation a future powered by renewable energy, sustainable in every sense. He was a professional. And he was a leader. With Charles' absence, we must work all the harder. No less tribute to this great man seems fitting. Charles was a graduate of Texas A&M and a military officer early in his career. I am proud to say that we had this in common. There is a great tradition at Texas A&M, called the Muster. Each year, on April 21, Aggies gather around to world to remember and honor those of their comrades who died in the previous year. The names of those who have passed are softly called, and a friend answers "here." I will answer "here" for Charles next April, and I invite others to do so as well. 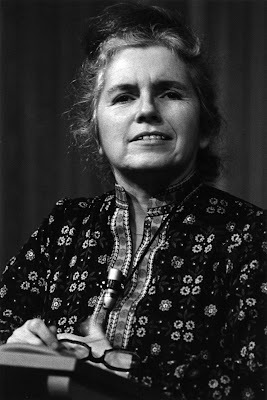 Grace Paley died last night. Alan Pogue sent these three photos in last night saying simply -- I want to get these out into the world. I miss her. I met her in Minneapolis in the early 80s. She and Meridel LeSueur were mentoring younger women writers. O Great Spirit! Paley had been ill with breast cancer for some time, her literary agent, Elaine Markson, said Thursday. Grace Paley is shown in her home in Thetford, Vt., April 9, 2003. Paley's output was modest, about four dozen stories in three volumes: "The Little Disturbances of Man" (Doubleday, 1959); "Enormous Changes at the Last Minute" (Farrar, Straus & Giroux, 1974); and "Later the Same Day" (Farrar, Straus & Giroux, 1985). But she attracted a devoted following and was widely praised by critics for her pitch-perfect dialogue, which managed at once to be surgically spare and almost unimaginably rich. Her "Collected Stories," published by Farrar, Straus in 1994, was a finalist for both the Pulitzer Prize and the National Book Award. (The collection was reissued by Farrar, Straus this year.) 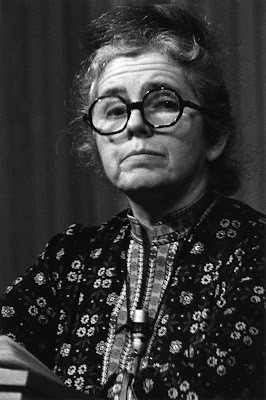 From 1986 to 1988, Paley was New York's first official state author; she was also a past poet laureate of Vermont. Paley was among the earliest American writers to explore the lives of women — mostly Jewish, mostly New Yorkers — in all their dailiness. She often focused on single mothers, whose days were a mix of sexual yearning and pulverizing fatigue. In a sense, her work was about what happened to the women that Roth and Bellow and Malamud's men had loved and left behind. To read Paley's fiction is to be awash in the shouts and murmurs of secular Yiddishkeit, with its wild joy and twilight melancholy. For her, cadence and character went hand in hand: her stories are marked by their minute attention to language, with its tonal rise and fall, hairpin rhetorical reversals and capacity for delicious hyperbolic understatement. Her stories, many of which are written in the first person and seem to start in mid-conversation, beg be read aloud. Some critics found Paley's stories short on plot, and much of what happens is that nothing much happens. Affairs begin, babies are born, affairs end. But that was the point. In Paley's best stories, the language is so immediate, the characters so authentic, that the text is propelled by an innate urgency — the kind that makes readers ask, "And then what happened?" "I was popular in certain circles,says Aunt Rose. I wasn't no thinner then, only more stationary in the flesh. In time to come, Lillie, don't be surprised — change is a fact of God. From this no one is excused. Only a person like your mama stands on one foot, she don't notice how big her behind is getting and sings in the canary's ear for thirty years. Who's listening? Papa's in the shop. You and Seymour, thinking about yourself. So she waits in a spotless kitchen for a kind word and thinks — poor Rosie. "Poor Rosie! If there was more life in my little sister, she would know my heart is a regular college of feelings and there is such information between my corset and me that her whole married life is a kindergarten." For Paley's immigrant Jews, the push and pull of assimilation is everywhere. Parents live in the East Bronx or Coney Island; their children flee to Greenwich Village. A family agonizes over its daughter's role in her school's Christmas pageant. Later stories are darker. A girl is raped; children die of drug overdoses. Threading through the books are familiar characters, in particular Faith Darwin, the subject of many stories, grown older and world-wearier. "Nu, how's by you?" the friend asks. "Ach," the man replies. "My wife left me; the children don't call; business is bad. With life so terrible, it's better never to have been born." "Yes," his friend says. "But how many are so lucky? Not one in ten thousand." Grace Goodside was born in the Bronx on Dec. 11, 1922. (The family changed its name from Gutseit on coming to the United States.) Her parents, Isaac and the former Manya Ridnyik, were Ukrainian Jewish Socialists who had been exiled by Czar Nicholas II: Isaac to Siberia, Manya to Germany. In 1906, they were able to leave for New York, where Isaac became a doctor. They had two children, and, approaching middle age, a third, Grace. Grace's childhood was noisy and warm, and always there was glorious argument. The Communists hollered at the Socialists, the Socialists hollered at the Zionists, and everybody hollered at the anarchists. "There is a certain place where dumb-waiters boom, doors slam, dishes crash; every window is a mother's mouth bidding the street shut up, go skate somewhere else, come home. My voice is the loudest. "'Ah, Mr. Bialik,' my mother replies, 'if you say to her or her father "Ssh," they say, "In the grave it will be quiet.'"" A self-described "somewhat combative pacifist and cooperative anarchist," Paley was an advocate of liberal causes. 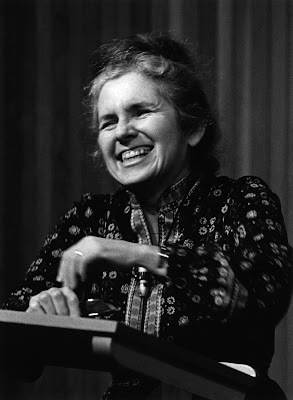 During the Vietnam War she was jailed several times for protests; in later years she lobbied for women's rights, against nuclear proliferation and, most recently, against the war in Iraq. For decades she was a familiar presence on lower Sixth Avenue, near her Greenwich Village home, smiling broadly, leaflets in hand. 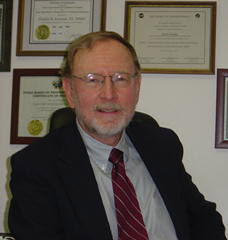 Paley, who taught for many years at Sarah Lawrence and the City College of New York, was also a past vice president of the PEN American Center. "I saw my ex-husband in the street. I was sitting on the steps of the new library. "Hello, my life, I said. We had once been married for twenty-seven years, so I felt justified. "He said, What? What life? No life of mine. "I said, OK I don't argue when there's real disagreement. I got up and went into the library to see how much I owed them. "The librarian said $32 even and you've owed it for eighteen years. I didn't deny anything. Because I don't understand how time passes. I have had those books. I have often thought of them. The library is only two blocks away. "My ex-husband followed me to the Books Returned desk. He interrupted the librarian, who had more to tell. In many ways, he said, as I look back, I attribute the dissolution of our marriage to the fact that you never invited the Bertrams to dinner. "That's possible, I said. But really, if you remember: first, my father was sick that Friday, then the children were born, then I had those Tuesday-night meetings, then the war began." Paley is survived by her second husband, Robert Nichols, whom she married in 1972. (They collaborated on "Here and Somewhere Else," which collects poems and stories by each of them, published this year by The Feminist Press.) She is also survived by two children from her first marriage, Nora Paley of East Thetford; and Danny, of Brooklyn; and three grandchildren. Her other books include a collection of essays, "Just As I Thought" (Farrar, Straus & Giroux, 1998), and several volumes of poetry, among them "Leaning Forward" (Granite Press, 1985) and "New and Collected Poems" (Tilbury Press, 1991). A film, "Enormous Changes at the Last Minute," based on three stories and adapted by John Sayles and Susan Rice, was released in 1983. In an interview with The New York Times in 1978, Paley described the grass-roots sensibility that informed her work. "I'm not writing a history of famous people," she said. "I am interested in a history of everyday life." I'm traveling today, so here is an oldie but a goldie. I was tempted to make a few edits because the piece is over 2 years old, but I didn't.. It's interesting to see what still rings and what doesn't. A reader from the left coast just sent me a letter that he had mailed out to his friends. Dave is a little concerned about the lack of reporting on the record ice melt in the arctic. I linked to the story in the "much ado" post, but I agree, this story is an important one. Here is part of his letter. 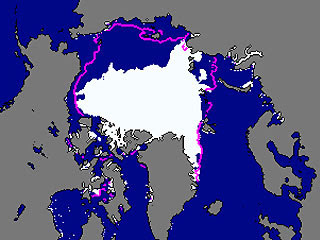 On Friday August 17, 2007, NSIDC (The National Snow & Ice Data Center) announced that the Arctic Summer Sea Ice had reached an all time low and had passed the prior record observed at the end of the melting season in September of 2005. There are some obvious and not so obvious comments applicable to this astonishing state of affairs. Please note that at the time of release there was still another 25% left of the ‘melting season’! The initial announcement was picked up by ‘The Indianapolis Star ": of course one might have expected in any sane society that this would have been leading the news in all media outlets but then again it did drift to ABC.com by Tuesday: quite frankly the events in Iraq pale by comparison. The lead scientist commenting on this situation was none other than Mark Serreze and the media printed his somewhat comforting comments, ergo that he doesn’t anticipate ‘clear water’ until 2030. The state of the US press can be defined as deplorable, controlled, or utterly inadequate for the publics needs on this basis alone: pick one! Serreze modeled the Arctic many years ago and concluded that there would not be clear water until 2100+ and irrespective of the overwhelming evidence he has been steadfast on this issue; after all if the facts don’t fit his hopelessly inadequate model the facts must be wrong! An extract from his telephone interview is, “The puzzling thing”, he said, “is that the melting is actually occurring faster than computer climate models have predicted”. Several years ago he would have predicted a complete melt of Arctic sea ice in summer would occur by the year 2070 to 2100, Serreze said. “But at the rates now occurring, a complete melt could happen by 2030”, he said Friday. Maybe he hopes to retire before his long line of hopeless reasoning is finally exposed. The stark reality is the models, all of them, and there are 18 concerned with the Arctic Summer Sea Ice alone, have on average been in error by over 3 standard deviations from the mean for well over a decade. In mathematical terms, and after all these are mathematical models, this means that they are totally invalid and in truth merely serve to further confuse the issue. Where do we see thoughtful analysis from some scientific correspondent? James Hansen explains this with even more clarity by stating that this will result in the end of the Holocene Period. " "There is a very small window of opportunity to attack this problem and those who are actively blocking this are actually committing crimes against humanity on an unthinkable scale. Ignorance is simply no excuse, because in an absence of open debate, this attitude is intentional, and it is high time to both admit it and demand action. But as Cheek and Chong said. But the End of the Holocene is. Protesters at Heathrow are getting banged up protesting the fact that government and business continue to act as if climate change doesn't exist. LONDON (Reuters) - British police with batons skirmished with groups of climate change protesters on Sunday near the headquarters of the operator of Heathrow airport. Earlier, marchers with carnival-style floats and speakers adorned with flowers blaring music left the camp with a banner saying: "We are armed ... only with peer-reviewed science." Must we quit flying to save the Planet? LONDON — For the hundreds of climate-change activists who have camped out near Heathrow Airport for the past week, there is only one way to reduce the carbon footprint of aircraft: Stop flying so much. There are alternative fuels. Concepts such as hydrogen-powered aircraft are considered to be decades away. But serious work is being done on biofuels as an alternative to kerosene in aircraft. Entrepreneur Richard Branson promised last year to funnel all profits from his air and rail companies into a new business, Virgin Fuels, that would pay for development of biofuels. "Some experts think similar personal carbon budgets — rationing — may be the solution." Let me repeat something I have said before. "The only thing worse than a deregulated carbon economy is a regulated carbon economy. That is why we must develop an advanced post carbon economy now. I remember the first time I flew. It was on an electra turbo prop. The first time I went to Europe it was on a gigantic prop plane. Back then, the airline industry was just taking off. Of course planes can fly on other fuel besides number 2 fuel oil. There is a professor at Baylor who has been proving it for a long time. And perhaps he and the Bransons of the world will be able to transform this young industry. Except for the police state rules, the invasion of privacy, and the horrible food, I rather like flying. But, sooner than we think, a lot of business trips are going to be replaced with virtual meetings where identical room spaces are projected creating a pretty good illusion of actually being there. This kind of virtual conferencing will become more and more commonplace as we all begin to reduce our carbon footprints. If you serve the same food and the waiters are dressed the same, you can even sit down and have lunch together. It will be better food than you get on the plane. Since its start, according to Leo’s bio on the site, the show has become very popular and has developed a following among people of a broad political spectrum who share a desire for positive change in the world. Indeed the mission of the show could be earthfamilyalpha's. Cover the world's critical issues. Reform ideological foundations of flawed institutions. Engage, provoke, and entertain listeners. Excel in all three talk disciplines: monologue, interview, and call-in. Set standards for integrity, honesty, intelligence, and civility. Lead listeners to think, act and change for a better world. Build a growing, dedicated, diverse, and interacting audience. Towards the end of the interview, Leo asked me what advice, what one thing could I leave his audience with. I said something about efficiency and made a comment about the transportation sector and the need to reexamine the way we transport ourselves. I spoke about the need to build high speed rail and light rail. Then we ran out of time. Earlier I had talked about how our world was soon to be going through a significant change, not unlike the change that occurred in World War I, when buggy whips were replaced by car keys. I explained how humankind is on the brink of a great new horizon where fuel becomes as anachronistic as hay is today. But, after listening to my reponse, I wish I would have said something like this. Just do your best to understand the full implications of the great challenge that humankind is facing. If you do, you will see that everything must change. Our economic system can no longer allow the externalization of costs onto other generations and other social groups. That means pollution must become part of the bottom line of any enterprise. We must create a photonic energy web. We must all become global citizens. Social capital and natural capital must be valued over wealth. We change our way of thinking. Maybe that is the New Capital that Leo is talking about. Leonardo DiCaprio's movie about climate change and the need for change is now out. Although I have not seen it yet, (it opened yesterday) I personally like the metamessage of the movie, and that is to make this darkest hour, humanities greatest triumph. "Important, immediate, well-paced, and more than just a Leonardo DiCaprio star vehicle, The 11th Hour introduces us to environment experts from around the world. Look out your window and take a deep breath. Cherish it, because perhaps you may not be able to someday. At least, that’s what The 11th Hour tells us. This is not a peripheral storyline, a puffy Hamptons profile or feel-good tale of raising $500,000 for the local church. 11th Hour’s message – reduce global warming and man’s carbon footprint – is center-stage important. It’s the most important issue for the coming generation or two, 11th Hour says. In the year 1800, only one billion people lived on earth, and civilization didn’t create excess waste heat. In 2007, the world population is more than 6 billion. We’re creating too much heat. Thus, the monumental problems. Besides aiming to teach younger audiences about our environment, 11th Hour handles political debate around corporate waste with savvy, taking the teeth out of a partisan struggle that amounts to distraction from facts. " True to its doom-laden title, global-warming doc "The 11th Hour" presents the viewer with reams of depressing data, loads of hand-wringing about the woeful state of humanity and, finally, some altogether fascinating ideas about how to go about solving the climate crisis. Docu's thesis, that mankind's insensitivity to the environment, consumption of limited resources and over-reliance on fossil fuels will soon make the planet uninhabitable for future generations, should by now (hopefully) come as nothing new to viewers. But the dizzying assemblage of talking heads (among them Stephen Hawking, Mikhail Gorbachev, science reporter Andy Revkin and heads of environmental orgs such as Lester Brown, Tim Carmichael and Wes Jackson), all well-spoken and at times prone to philosophizing, turn "The 11th Hour" into a ruminative essay on what it means to be human in a scarce world." Reviewing a movie that is telling the hard truth of our cultural predicament is a little like writing a review about Paul Revere's clothes , or writing a critique of his riding skills on the night of his famous ride. The important fact is, did he get the job done. "Let us turn Mankind's darkest hour into our finest. 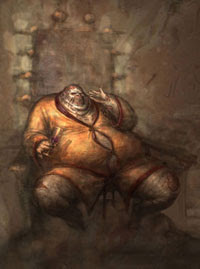 Asra’a, (Alan Pogue) Abu Floos, © 2001. 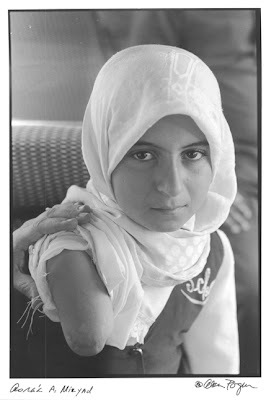 Asra’a's New Arm, (Alan Pogue) Houston, © 2004. Asra’a stands next to a world famous photograph of herself. I was nervous about meeting her. I don’t speak Arabic and my country is bombing hers. How is it possible that she does not hate us? A friend translates. I tell her Alan said she liked bracelets and I’ve brought some. Asra’a accepts a pink Strauss Crystal bracelet and two necklaces, one shell and one made of black stone. She is fourteen-years-old. 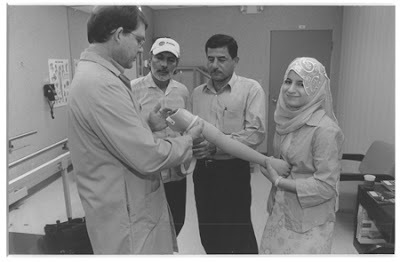 Alan photographed her in Iraq, and then spent three years arranging for her to come to America to be fitted for a prosthetic arm. 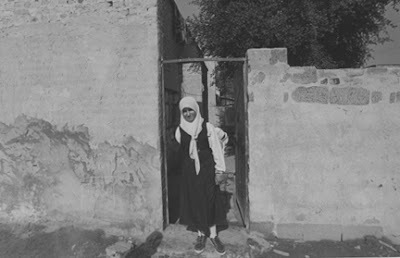 Asra’a has been plucked from a village where bombs explode between home and school, where hundreds of people have depleted uranium sickness, where the water is bad, where her mother and five siblings wait for her return. She and her father work with doctors in Houston to make the arm work. She’s to wear it for short periods each day. Asra’a and her father have not traveled out of Iraq before. How must we look to them? Asra’a sits beside me. She shows me her watch. I point to the 12 and say “twelve.” Then point to the 1 and say “one.” She begins to count. She says the numbers in English from one to 24. I ask her for the numbers in Arabic. I am a dolt in foreign languages, but repeat each number as she carefully pronounces it for me. Her father checks on us, corrects my pronunciation. We count in Arabic to twelve, then to 24. Asra’a counts in English to thirty, then forty. She gets confused in the teens and goes back to them. We count again, laughing when she gets the numbers right more often than I do. I remember learning to count in Norwegian, an astounding process that involves addition, fractions and thinking back and forth in time. Asra’a counts to fifty, and sixty and seventy, then eighty. In the exhibit hall I point to a photograph of her family. She tells me one woman is “aunt” and shows me “brother” and “sister.” She says one is “Mama.” She shows me a photograph of “house.” And one of “school.” She points to an open sewer in the street and to a photo of people who have gathered to repair the water treatment plant. If we can open our hearts, children will teach us what they need and how to communicate with them. Asra’a’s Home, (Alan Pogue) Abu Floos, © 2003. 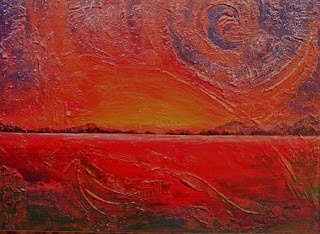 "The View from Asra’a’s Front Door, (Alan Pogue) Abu Floos, ©2003. 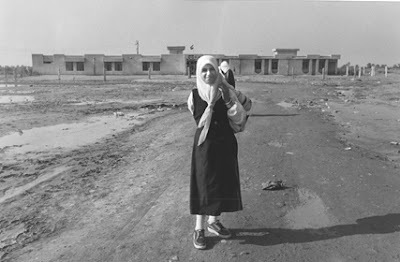 Asra’a’s School, (Alan Pogue) Abu Floos, ©2003.